We all remember the story of Icarus, right? The son of imprisoned Greek inventor Daedalus who flew too close to the sun on wings of feathers and wax. It’s a cautionary tale that investors should take to heart. Sure, a stock or investment can remain in a bullish uptrend for longer than anyone would expect, just as Icarus was able to fly inconceivably high with only feathers and wax. But, sooner or later, those high-flying stocks have to come back to earth. In the investing world, market sentiment fills in for Icarus’ wings … and it’s just as fragile. If sentiment heats up too much, it will melt, with predictable results. Such is the case with Amazon.com Inc. (Nasdaq: AMZN). This year, Amazon made inroads into the Indian market and continued to press for an advantage in China. The company expanded into brick-and-mortar stores and grew its home-assistant offerings with new versions of its Echo devices — all with the intent of making it easier for customers to spend money at its online store. Then, in July, Amazon paid $13.7 billion to acquire Whole Foods Market in a bid to flex its muscles in the grocery market. It seemed there was no market that Amazon couldn’t conquer. Wall Street gobbled up the growing bullish sentiment, and the financial media proclaimed that Amazon was going to take over the world. Can you fly any higher than taking over the world? One of the biggest reasons AMZN stock is up more than 20% this year is because Amazon was finally showing growth in net income. In fact, prior to its most recent quarter, Amazon’s net income had grown for eight straight quarters. Most of this growth came from red-hot units like Amazon Web Services (AWS) and Amazon Prime subscriptions. Amazon’s bottom line was also under less pressure from heavy spending, which the company has no fear of doing. Midyear, however, Amazon once again ramped up spending. In addition to dropping a huge chunk of change on Whole Foods, it has laid out billions for new original content for Prime Video in an effort to keep up with Netflix Inc. (Nasdaq: NFLX). As a result, Amazon’s second-quarter income fell 77%, putting an end to the growth spurt. That was before the Whole Foods acquisition. And if you think Amazon’s spending on Whole Foods ends at $13.7 billion, you’re in for a surprise. The company has already moved to slash prices at Whole Foods stores, which is sure to impact earnings going forward. Furthermore, it will take even more money to integrate the Whole Foods chain into Amazon’s online store and implement the rest of the company’s strategy for the grocery market. With such a price tag on the line, and billions in potential revenue at risk if it doesn’t succeed in the grocery market, Amazon will spend heavily to make sure this gamble works. In short, don’t expect Amazon to post net income growth again for some time. But risks to income growth are just the start of Amazon’s problems. Much of the company’s revenue growth has come from AWS, but that, too, is at risk. In a move to compete with Amazon, many retailers signed up for AWS as a necessary evil to advance their online presence. But now, those retailers may be moving on, emboldened by success stories like Best Buy Co. (NYSE: BBY). Formerly derided as “Amazon’s showroom,” Best Buy proved it can hold its own against the online e-commerce giant, reporting stellar second-quarter earnings results. What’s more, Target Corp. (NYSE: TGT) just announced it is cutting ties with AWS and striking out on its own. Furthermore, Amazon is aware of the problem, and has lowered subscription fees for AWS, cutting further into the company’s bottom line. With Chinese barriers proving all but insurmountable, and competition heating up in India, the path toward international growth in two of the hottest global economies is far from certain for Amazon. It’s truly impressive how quickly market sentiment can shift. In just a few short weeks, Amazon has gone from ruling the world to fighting off competitors in key markets and spending heavily on growth stateside. And Wall Street is watching. The erosion in bullish sentiment and the projected end of net income growth are weighing heavily on the shares. Since peaking just shy of $1,100 in late July, AMZN stock has fallen nearly 10%. If price action continues to weaken, there is considerably more downside ahead of AMZN stock. 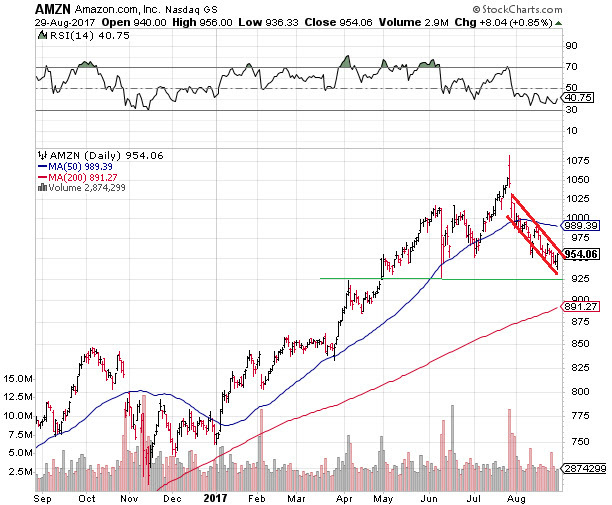 After breaking below its 50-day moving average, AMZN stock entered a downtrending channel that has longer-term bearish implications. First, because AMZN is on the verge of breaking support at $950. Second, because firm support doesn’t emerge until the $900 area. What’s more, if my colleague Chad Shoop is correct, and a market correction is on its way, this key level of technical support could fall as well. Below $900, it’s a straight shot to $850, making a potential overall decline of nearly 30% for AMZN stock from its July all-time high. The bottom line: Avoid Amazon stock for now. There are better investments to be had.